Many collectors in Britain and around the world have seen the label shown here. This disc was advertised in ‘Television’ magazine in 1934 as a product of the ‘Major Radiovision’ company and distributed and sold through Selfridges. 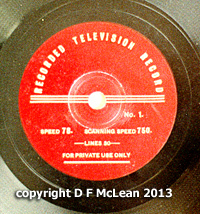 Compared with Phonovision, this is a common disc made commercially for the growing number of television viewers. The disc was not intended for entertainment but for testing and aligning 30-line displays. The disc itself is a double-sided 10-inch (254mm) diameter. From the disc surface, there appears to be 10 ‘tracks’ per side. In fact these are simply the unmodulated silences between the recorded test images. Apart from the label and the content, this could be like any other 78rpm disc of the day. Listen to this extract from the disc which is of the image shown below: a converging fan of black and white bars. This sounds like a frequency sweep and is a means of determining the resolution of the system directly from seeing where the bars blur vertically into grey. Unlike the Phonovision recordings, this recording was meant for replay at 78rpm. This gives a video signal of 30 lines per frame, 12.5 frames per second – the Baird standard. Compared with the Phonovision discs and the private recording of a 1933 transmission, the material on this disc is uninspiring. Each side of the disc consists of a series of still pictures that are slid in, left for about 20 seconds or so and slid out to be replaced by the next one. Two of the pictures are slid in mirror-reversed. From this we can tell that the pictures are transparencies – lantern slides – which have been back-lit. The purist would argue that this is pre-Baird in concept (like Jenkins’ shadowgraph). The stills show signs of arc-scanning. This means the camera was a Nipkow disc. However in 1934 when this disc was sold, Nipkow discs had been replaced by mirror-drum cameras in the studios. The disc fails as a reliable source of high quality 30-line test video. The quality of the video imagery is marred by a 5kHz ‘ringing’ – possibly head-cutter resonance. Only after this is notched out does the high quality of the images start to become apparent. Like the earlier Phonovision recordings there are no synchronising pulses in the video signal. The disc had to be played back on domestic equipment. Even with precision alignment of the disc on playback there is a noticeable ‘bounce’ caused by residual off-centre playback of the disc. All but one of the still pictures on the disc are cartoon-like head-and-shoulders views. Some look familiar. The exception is a frequency test pattern at the end of the second side of the disc shown here. The BBC archive has a pressing entitled 12PH/69727 which their database and the label on the disc says it’s ‘a recording of an actual transmission’. The BBC disc is in fact only a poor transcription copy of the Major Radiovision disc. The evidence for that rather than the other way around is that the quality on the BBC disc is quite a bit worse than the Major Radiovision disc. The BBC label is highly likely to be incorrect – although undoubtedly test transmissions would have taken place. 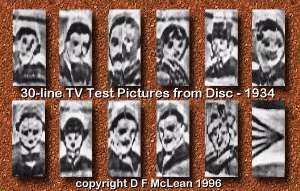 Was the Major Radiovision disc a recording of a test signal transmission by the BBC? Highly likely – no. The reason is that any test transmission by the BBC would have been done using the equipment they had, and we know that the caption scanner (reflected light latterly on an drum holding 8 captions) and the studio camera were scanned using a mirror drum mechanism. The Major Radiovision recording was most definitely scanned with a Nipkow disc and used back-lit lantern slides. The BBC had no mechanism from 1932-35 to do this. This is a disc that collectors might wish to aim for. It is the only disc of 30-line video that was sold to the general public. There used to be a few copies of this around in the 1970s and 1980s and they traded for around £300 ($500). It is touted as a Baird disc and has even been called Phonovision. Phonovision it absolutely and most definitely is not. The disc is ‘Baird’ in that it complies with the Baird standard for 30 line TV. It is doubtful that either Baird, the Baird Company or even the BBC had anything to do with this disc. That this is a series of static images marred prior to or during recording means that this disc falls far short in material content to all other recordings found. Nevertheless, it remains a contemporary record of 30-line TV and is historically important.